Over on sportsbet.com.au, you can bet whether the next interest rate move will be up or down. (It’s hidden away in the ‘novelties’ section). Right now, the result that the next move is up is paying 1.2, while the odds that rates go down is paying 3.7. That’s quite a spread, and it aligns with economist sentiment in the market. There seems to be a lot of confidence that the next rate move will be up. I have no idea where they are getting this from. I can kinda see where they got the idea. Largely it’s an international and US story. The era of quantitative easing (=crazy-eyed money printing) is over. 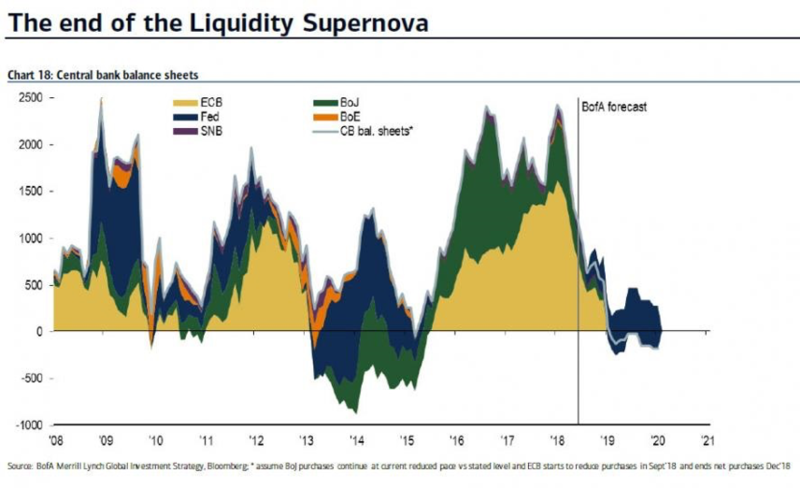 The liquidity super-nova it unleashed is petering out. That’s what this chart shows. The amount of money sloshing around is coming back to a neutral level. That’s the Bank of America forecast. And the US Fed is starting to tighten rates. So, that all suggests that Australia will have to raise rates soon too. That’s what these so-called ‘economists’ are saying. The RBA has also been taking to the hustings to let us know that they’d prefer rates to be higher. I’d prefer Hugh Jackman to be my personal foot masseuse too, but that doesn’t mean it’s going to happen. Because against the international push to higher rates, there’s nothing in the domestic economy that suggests that we need higher rates. Not that I can see. First, national dwelling prices have slipped into negative territory, largely thanks to a correction in Sydney. 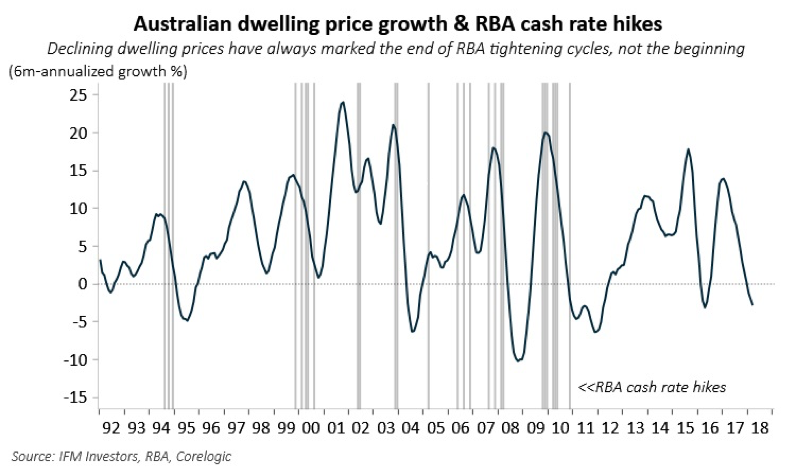 I don’t think this is a huge thing to worry about, and a bit of consolidation after a crazy few years is probably a good thing, but it does make it hard to see the RBA hiking rates into falling housing prices. I mean, they have literally never done that in the past. That’s what this chart shows. Since the dawn of independent monetary policy, the RBA has never hiked rates while house price growth was negative. It’d be pretty flipping unusual. At the same time, labour market outcomes aren’t amazing. Labour under-utilisation is rising, which tends to correlate with falling wages growth. 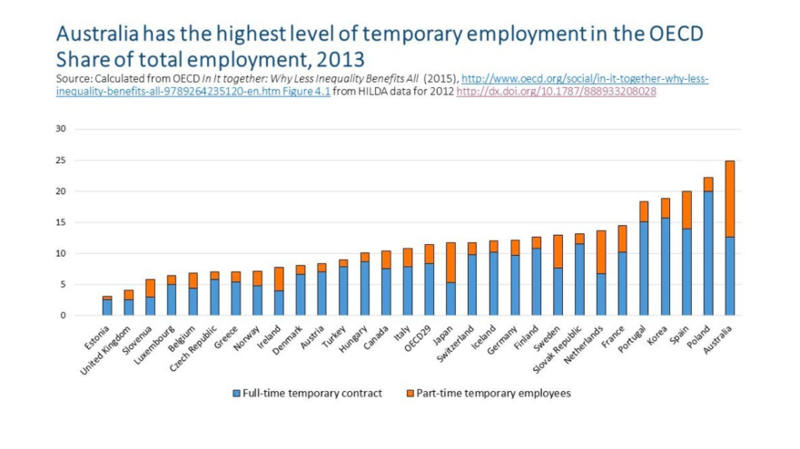 What’s worse, it’s just been revealed that Australia has the most temporary work of any nation in the OECD! How did that happen? I don’t remember voting for that. 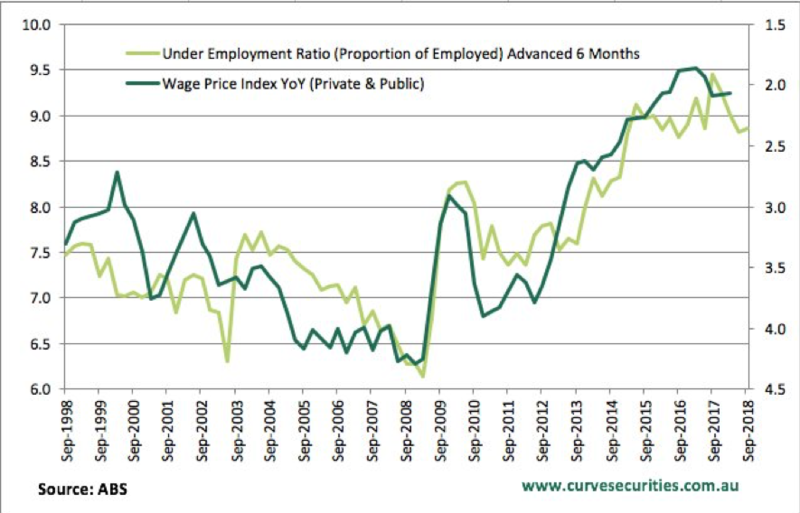 But in that environment, where there’s slack in the labour market, and people are working roles that give them little bargaining power, there’s little chance that wages are going to lift much or put any pressure on interest rates. And to top it all off, we’re already in a tightening cycle, thanks to tougher loans standards at the banks. APRA and the Royal Commission are taking their toll, and the banks are pulling hard on the reins. That’s going to put a further brake on house prices and consumer spending. So there is nothing that I can see that’s going to encourage the RBA to hike rates, as much as they might like to posture themselves that way. And between now and whenever the economy is hot enough to justify a rate hike, you’ve got to hope that there’s nothing on the international stage that gives the Australian economy a bump. That’s kind of a long shot. So for my money, 3.7 seems like mispriced odds. I’m not saying you should put money on it. There are better things to take a punt on.